We are honored to announce our two inimitable speakers for the evening’s program: Jane Golden, Founder and Executive Director of Mural Arts Philadelphia and Alumni Spotlight: Trang Do (261), CBS 3 Eyewitness News General Assignment Reporter. The Annual Meeting & Dinner is the organization’s signature event of the year. Attracting up to 400 alumni, students, administrators, faculty, and staff a year, the Annual Meeting features the coveted Disharoon award ceremony, AACHS President’s report and the election of officers and members of the AACHS governing body, the Board of Managers. This year’s dinner will feature a cocktail reception hour beginning at 5PM, followed immediately by our program and dinner. Come out to hear from our two speakers as they impress upon us on their personal and professional experiences in the field of media and arts and how they have positively affected the city and community. The program will also include an update from CHS President Tim McKenna on the state of the school. Ticket Prices are: $65 for classes 274 through 278 and CHS Faculty and Staff and $90 for classes 273 and prior. Meet some of our remarkable current students leaves a lasting impression and receive first-hand accounts on the great things happening at Central today including our exciting capital project to improve Central for the students of tomorrow. As always, you can share this wonderful experience by sponsoring a current student for $85, whether you attend or not. Sponsorships for the event are available here: Sponsorship Levels Form. The return of the successful Class Sponsor Table opportunity is also available! The dress code is business casual and CHS colors always seem most popular. Proceeds from the Annual Meeting & Dinner benefit AACHS’ mission to support student success at Central today and in the future. As a sponsor or attendee, you or your company will enable students to develop problem solving skills, a life-long passion for learning, and aspirations to be thoughtful leaders of their generation. Please register online to reserve your seat or download the AACHS Annual Meeting 2019 Printable Form and return it by mail. We look forward to seeing you on Thursday, May 2, 2019. The 212 Classs will be holding its 60th Anniversary at Central High School on May 3, 2019 from 10:00 AM – 2:30 PM. Members of this class will tour the building, be a part of a special ceremony to commemorate their graduation, have lunch and catch up with fellow classmates. Many of the 217 class has migrated south and therefore decided to host their classmates 75th birthday celebrations in Delray Beach, Florida! Some people are coming for the week and some for the weekend. The Host hotel, Delray Beach Marriott, is located across the street from the ocean. There are special rates for the 75th birthday celebrations, but you must book by April 3rd. Thank you. Cash Bar – cocktails at 6:30, dinner 7. Join the 192nd Class on Sunday June 9, 2019 at Plymouth Meeting Doubletree Hotel from 12 PM – 4 PM (featuring guest speaker from AACHS)! Please contact Sam Hoffman, samahoffman32@gmail.com, for additional information on how to register for event. 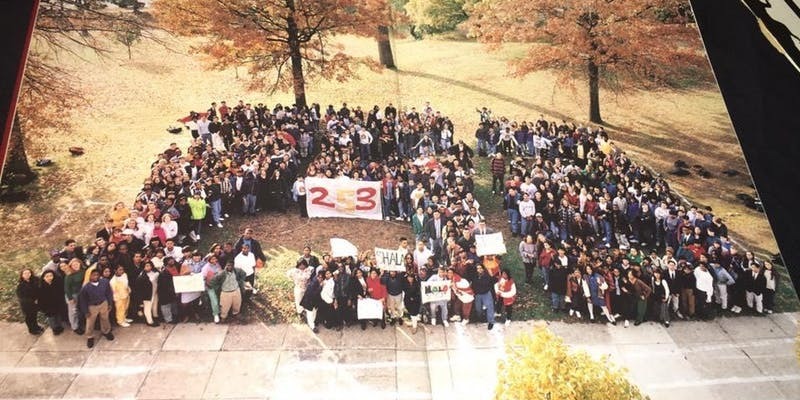 253 Celebrates its 25th Class Reunion! 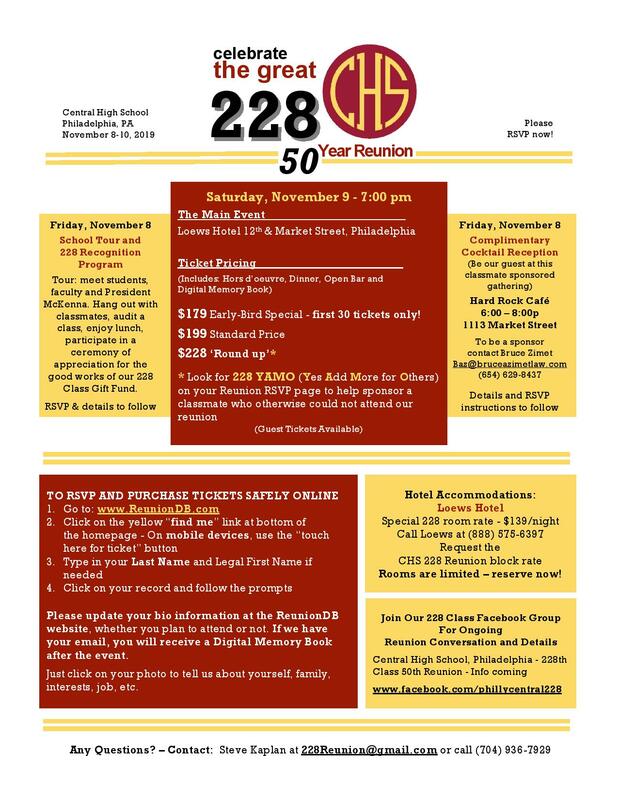 The 253rd Graduating Class of Central High School Invites You to our 25th Class Reunion! Come out and party like it’s 1994! A portion of each ticket sale will be donated to the Central High School of Philadelphia Annual Programming Fund (Supports offsetting costs such as college application fees, prom fees, class trips, etc. for current students). 213 Class reunion will be held at the Bala Country Club on Saturday, October 19, 2019 cocktails will begin at 5:30 followed by dinner. Tentatively, there will will be a luncheon and tour at CHS on Friday, October 18, 2019. [Tour will be confirmed upon the release of the 2019 school district calendar] . 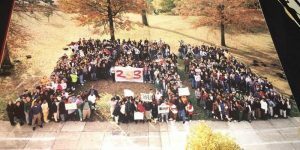 258 Celebrates its 20th Reunion! 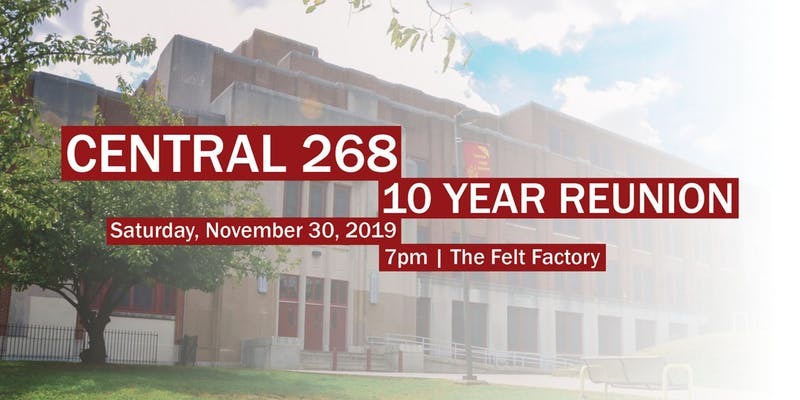 Please join the 258 in celebrating its 20th Reunion on Saturday, November 30, 2019 at Barra Rossa. The event will be from 7 PM – 10 PM. The cost is $55 for buffet with cash bar; plus-ones are welcomed. All former faculty welcomed at no charge. Please contact David Hildebrand at drhildebrand@hotmail.com for questions. Thank you.